Kevin Chappell makes a rarely seen late round 'adjustment' on the course. His Chiropractor was on site, adjusting him between holes so he can function at his best. Researchers have proven over and over that exercise pumps up more than just muscles - it can also improve memory and other brain functions. But a lot of those studies have focused on gray matter, the stuff useful for memory that shrinks in old age. New research says fitness boosts another kind of brain matter, the white kind. Examining the brains and fitness levels of 24 children ages 9 and 10, scientists at the University of Illinois at Urbana-Champaign said white matter is thicker and denser in the fitter kids. That suggests a greater capacity for memory, attention span and cognitive efficiency. "Previous studies in our lab have reported a relationship between fitness and white-matter integrity in older adults," said psychologist Arthur F. Kramer in a news release. "Therefore, it appears that fitness may have beneficial effects on white matter throughout the lifespan." Here's the disclaimer part. Exercise isn't necessarily going to make you smarter. You still need to study for your history exam. And you'll still need to make some effort to learn your nephew's new girlfriend's name (was it Lisa? Laura?). In fact, the researchers in the new study, published Tuesday in Frontiers in Human Neuroscience, took things like IQ and learning disabilities out of the equation, testing solely for the impact of fitness on the physical brain. Surprisingly, it doesn't take much to make improvement, other studies have shown. For example, if you're over 50 and sedentary, just six weeks of regular aerobic workouts can improve memory noticeably. In another study, kids with ADHD instructed to walk briskly for 20 minutes performed better in reading comprehension and math exams. Can Chiropractic Help Those with ALS? Amyotrophic Lateral Sclerosis (ALS) is a motor neuron disease that is often referred to as "Lou Gerhig's Disease." It usually occurs in people between 30 and 60 years of age, and it affects the use of muscles to the point of paralysis. The nerve cells that control the muscles begin to degenerate, causing muscles to weaken and eventually stop functioning. It also affects the lungs and the ability to write and speak. There is no cure for this ALS, but there are methods to help with the pain and mobility. A study, performed at Life Chiropractic College West Health Center in June 2002, showed that Chiropractic spinal adjustments could help ALS. Conservative adjustments of the spine were performed on an ALS patient in a wheelchair. The adjustments were made manually by a Chiropractor once a week, and then only twice a week because of the distance the patient had to travel. Still, this treatment resulted in him complaining less of pain and demonstrating a larger range of motion in all directions. According to the ALS Association, no two patients have the same experience, so each patient must experiment with treatment options to find what will work best. Between studying, homework and extracurricular activities, going back to school may make kids feel like they have the weight of the world on their shoulders. And sometimes, they literally do. After you pile a lunch, school supplies, binders and textbooks -- which typically weigh 3.5 lbs each - into your child's backpack, the load he or she is lugging around could be potentially dangerous. According to the U.S. Consumer Product Safety Commission, at least 14,000 children are treated for backpack-related injuries every year. 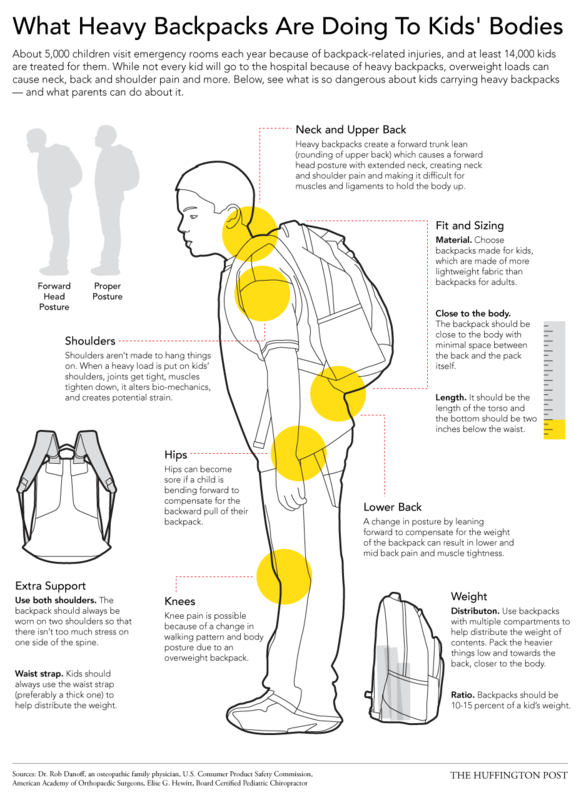 Chiropractors recommend that the weight of a backpack should be less than 10-15 percent of a child’s body weight. Too often, children don't wear their packs correctly, increasing risk of injury. Improperly used backpacks may injure muscles and joints and can lead to severe back, neck, and shoulder pain, as well as posture problems. If you have questions about back packs and if they are fitted properly for your child, let us know.